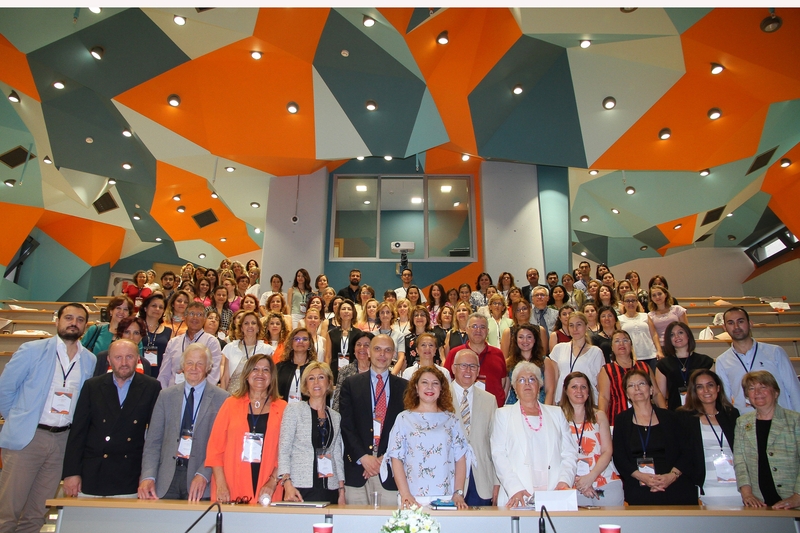 Graduate School of Health Sciences, Izmir University of Economics held a “Graduate-Post Graduate Student Supervision in Biomedicine and Health Sciences: ORPHEUS Perspective” titled workshop. It has been pointed out that there were 430 thousand 215 Master’s students and 91 thousand 262 PhD students in 2016 – 2017 academic year in Turkey, and that serious progress was needed to be made in PhD programs. Prof. Dr. Sezer Komşuoğlu, Advisor to the President of the Council of Higher Education (YOK), IUE Rector Prof. Dr. Can Muğan, IUE Vice Rectors, Prof. Dr. Murat Aşkar and Prof. Dr. Filiz Başkan, Michael Mulvany, Chair, ORPHEUS Labelling Board, academicians, and students attended the workshop. Prof. Dr. Sezer Komşuoğlu indicated that Turkey ranked in second with number of most students in European higher education system. Komşuoğlu said, “We have 7 million 6 thousand 10 students in higher education. It may sound too much, but it is actually nice to have this many higher education students in an 80 million people country. In Turkey, there are 129 state universities and 72 foundation universities. There are also 5 vocational schools (not affiliated with any university). There are approximately 4 million male, and 3.5 million female students. In 2016 – 2017 academic year, there were 2 million 555 thousand 926 associate program students, 4 million 71 thousand 579 undergraduate program students, 430 thousand 215 Master’s students, and 91 thousand 262 PhD students. We have the critically low numbers in PhD programs. At least one third of students at high quality universities should be in PhD programs. We have failed to reach that number unfortunately. We are working hard to increase the number of PhD students”. High impact researches should be conducted, pointed Prof. Dr. Komşuoğlu and said that the ratio of high tech products to export in manufacturing industry was way below the EU and OECD averages. “We need to produce high technology. When we analyze the sectorial distribution of R&D expenses, we can see that the share of universities in 2006 was 53%, private sector 37%, public 12% whereas in 2016, the share of universities went down to 36%, private sector went up to 54%, and public went down to 10%. We need to progress more, especially in PhD programs. PhD is believed to be the start of a scientific based job. And the outset of that is research. In the future, we will be discussing education through research. 2 thousand students under 100 thematic areas are receiving scholarship. One thousand 354 of these scholarships are given to female students. We have reached 15 thousand in scientific publication in 2006, and 32 thousand in 2016. Nevertheless, it is still low in per million people. Scientific publication per million people in USA is one thousand 329, in EU one thousand 481, whereas in Turkey, it is only 395. We are not a writing society. When we do, they are not high impact publications. We have to take important steps in academic publishing,” said Prof. Dr. Komşuoğlu. IUE Rector Prof. Dr. Can Muğan pointed out the importance of postgraduate education in excelling in any of the disciplines. Prof. Dr. Gül Güner Akdoğan, Director of IUE Graduate School of Health Sciences, stated that ORPHEUS (Organization of PhD Education in Biomedicine and Health Sciences in the European System) was the only authorized system that was committed to developing and disseminating best practice within PhD training programs in Europe. Prof. Dr. Akdoğan reported that currently ten universities from Turkey were members of ORPHEUS, and Izmir University of Economics was in the process of applying for membership as well. She said that supervision topic was addressed in terms of academic, social, and psychological dimensions at the workshop. “We sought answers to the question of how a perfect supervisor should be. The workshop included many meticulous events such as presentations by expert scientists and educators, small group studies, panel by representatives of graduate schools of health sciences that are ORPHEUS members, PhD students’ panel, and open sessions, etc. The workshop proceedings will be published in the Journal of Turkish Biochemical Society as a special issue,” stated Prof. Dr. Akdoğan.